There is eggs-tra incentive to visit Crabble this Friday afternoon! 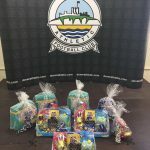 Dover Athletic and the Dover Athletic Community Trust volunteers have donated eight Easter hampers (Pictured) to be raffled away during half-time of our home match against Aldershot Town. 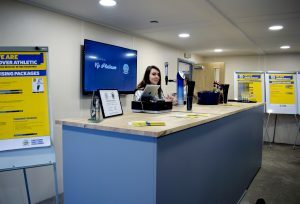 Home fans will each receive one free raffle ticket entering them into the draw upon arrival at the ground. We are very pleased to welcome Pat Sutcliffe to our team as our first employee of the Dover Athletic Community Trust. Pat has a genuine passion to make our trust a massive success in our local communities and has a breadth of experience and a variety of contacts that enables him to fulfil the role. The success of this role and how we develop our trust will very much be down to the relationships we nurture within our community and beyond and enable us to build a variety of opportunities to invest in and improve the Dover district and its community needs. 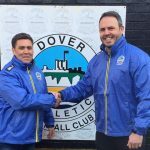 I’m sure all involved with Dover Athletic will join us in wishing Pat every success in his new role and support him on this journey. Pat will very much take the lead on delivery of our community intentions. This is the start of something potentially very powerful and impactful in our community where we can make a real difference! 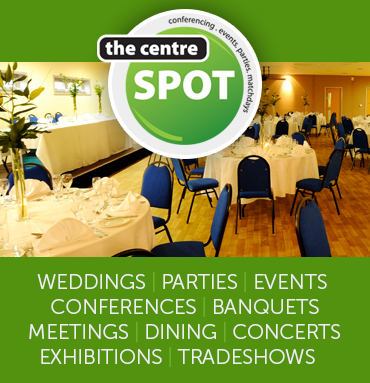 Come and join us for a Christmas Party in the Centre Spot. 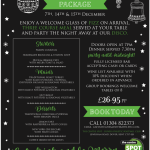 Eat, drink and get in the festive spirit with a choice of three party nights, December 7th, 14th and 15th, for just £26.95 per person. The party starts the minute you arrive and you will be welcomed with a glass of chilled bubbly before you sit down and enjoy a delicious three course meal. After the meal, the dance floor will be open and you can party the night away. Doors open at 7pm on each night with dinner served from 7.30pm. We are delighted to announce that our successful VIP Platinum experience for all supporters has been extended until the end of the season. 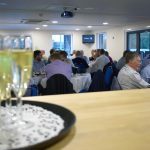 For every remaining home National League game, we will be offering passes to the new VIP Platinum Suite for only £25 per person. Please note that this price does NOT include entry for non-season ticket holders who do attend, and they will still need to pay entry on the turnstile on the day. Dover Athletic Community Trust is seeking to appoint a Community Development Officer to develop and deliver an innovative and compressive community programme aimed at establishing permanent and sustainable links with all members of the local community. The successful candidate will also coordinate and grow established projects,while actively establishing new projects. The role is for 24 hours per week and includes some weekend working. Deadline for applications is November 8th 2018. Dover Athletic Community Trust is the official charity of Dover Athletic Football Club and will deliver creative, innovative and diverse engagement initiatives using the power of Dover Athletic to motivate, educate and inspire people in communities to improve life chances. The vision – for children, young people and adults within our community to be confident, active, healthy and able to determine and achieve their own personal goals and aspirations. 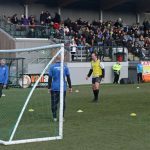 The mission – to enhance people’s lives by using the unique strength of Dover Athletic Football Club to engage, enable and empower people. Vanarama, the UK’s leading commercial vehicle leasing company, powered the fundraising drive by sacrificing its naming rights for the National League, together with a vehicle leasing initiative, ‘lease a van save a man’, which ran throughout September and October. A cheque for £150,000 was presented at the flagship BT Sport televised game for Non-League day between FC Halifax and Chesterfield. The presentation took place ahead of the game when ultra-marathon hero Kevin Webber, who had just completed seven walking marathons in seven days, was given a guard of honour by both sets of teams. 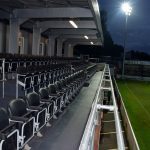 The £150,000 was raised by Vanarama in just 43 days by donating £50 for every vehicle it leased from the start of September until Non-League day on October 13th. Within that time a staggering 688 men would have died from prostate cancer, highlighting just how important it is that more men are made aware of the most common cancer in men. 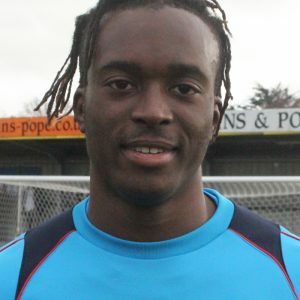 Prostate Cancer UK became the National League’s first official charity partner for the 2018/19 season and this year’s Non-League Day was given added significance by the presence of Webber. Diagnosed with incurable prostate cancer in November 2014 and told he could have as little as two years left to live, the remarkable Webber has raised thousands for the charity in a series of epic endurance events and in the build-up to Non-League Day he walked more than 180 miles from Blyth Spartans to FC Halifax Town. 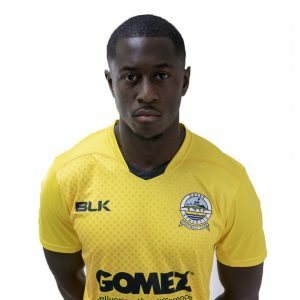 In total, he visited 10 National League clubs, hand-delivering unique captains’ armbands to be worn by all MANarama teams on Non-League Day. The bright orange band, which includes the iconic Prostate Cancer UK logo, illustrated the clubs’ united stand against the most common cancer in men. Also joining the fight was Prostate Cancer UK ambassador Jeff Stelling, who posed with one of the armbands alongside Hartlepool United skipper Andrew Davies ahead of their clash at Leyton Orient. National League Chief Executive Michael Tattersall, who walked alongside Webber in the final day of his challenge, said: “We’re delighted at the response of our temporary – and historic – rebranding to the MANarama National League over the past six weeks and it’s wonderful to see so much money and awareness raised to aid the fight against prostate cancer. Andy Alderson, Vanarama CEO and Founder said: “At Vanarama we’re thrilled with the amount of money we’ve been able to raise for Prostate Cancer UK. The MANarama campaign brought together three great organisations with one main goal – to raise awareness and funds in the fight against the most common cancer in men. Angela Culhane, Chief Executive of Prostate Cancer UK, said: “We’re thrilled with the continued success of Non-League Day, and to pick up a cheque from Vanarama for £150,000 is a wonderful end to this campaign. Our walking football sessions during September will be open to everyone (Aged 18 and over). Each session costs £3 and all fees will be donated to Prostate Cancer UK. Sessions take place every Sunday at Crabble from 10am until 11:30am.